Fashion brand COS has partnered with Dutch designer Olivier van Herpt on a set of six vases 3D-printed from clay. The designer used the label’s Spring Summer collection as a basis for his designs, taking particular notice of the shapes, colours and textures of the fabrics used. “It’s almost as if the clothing and wearer merge together to create new forms, and I used this idea as the starting point to develop the vases,” said van Herpt, who graduated from an industrial design course at Design Academy Eindhoven in 2015. His pieces feature gently curved exteriors, with some vases made using a rounder body and others with more angular forms. Seen from a distance, the surface of the clay appears smooth, but a closer look reveals tiny ridges created by the 3D-printing process. This ribbed design allows van Herpt to build larger, more stable objects, while concealing the structural layers made during printing. Van Herpt first started developing his own 3D printers in 2014 after becoming frustrated with the limitations of existing desktop printers. Having spent two years experimenting and researching, the designer created an extruder that could process hard clay. “Throughout my life I’ve been captivated by those parts of the making process and this is my goal as a designer: I want to make machines that enable others to create,” he continued. 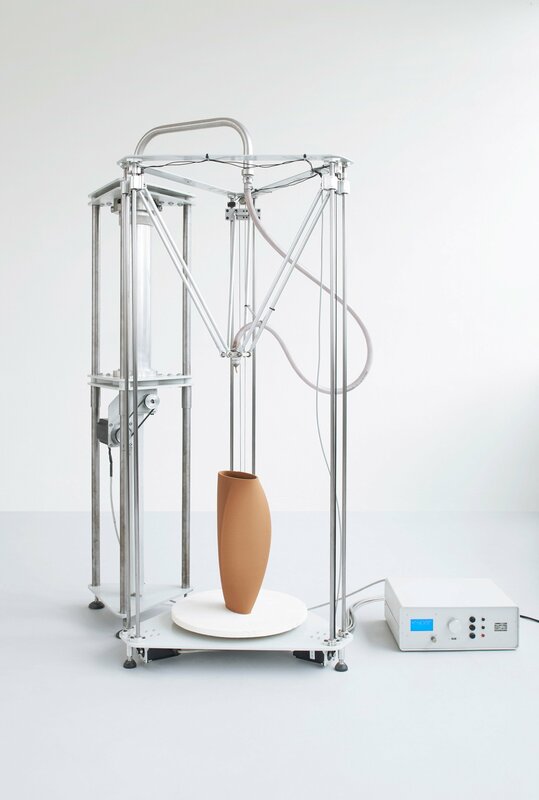 The designer, who runs his own studio in Eindhoven, has just completed the final prototype of his clay 3D printer and hopes to start production soon. The vases will be shown in COS’s Regent Street store in May, alongside images of van Herpt’s process. COS also plans to give away the vases via a social media competition, inviting followers on Instagram to share images of their favourite ceramics. COS has partnered with several designers over the years, most recently collaborating with Studio Swine on an installation for Milan design week that blew out mist-filled bubbles. The brand took 45th place in Dezeen Hot List, with its dramatic collaboration with architect Sou Fujimoto propelling it to second place in our fashion hot list. The post Olivier van Herpt designs 3D-printed clay vases based on latest COS fashion collection appeared first on Dezeen.